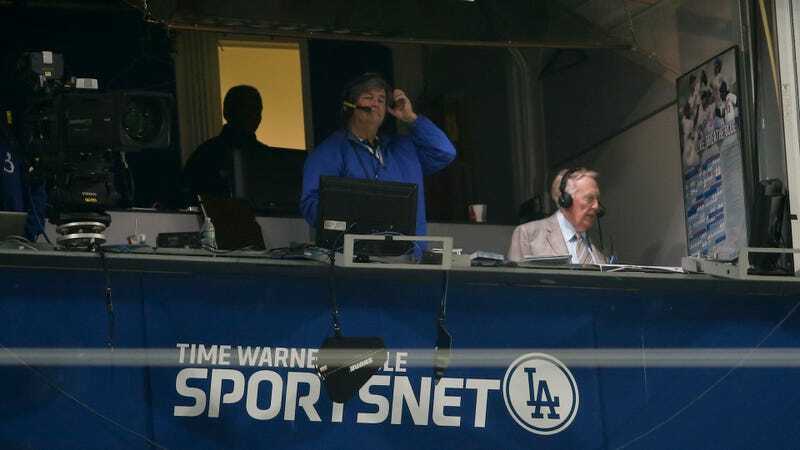 Three years ago the Los Angeles Dodgers partnered with Time Warner Cable to create SportsNet LA, a regional sports network that carries Dodgers games and no other interesting programming. The deal was worth a reported $7 to $8 billion over 25 years for the team, by far baseball’s largest local television deal. To make back those billions, Time Warner Cable tried to charge television distributors—Charter, Cox, DirecTV, Dish Network, AT&T U-verse, Verizon FiOS, and others—$4.90 per month to carry the channel, with that amount escalating each year. That’s an extremely high carriage fee for a network whose only must-see programming is Dodgers games, and those distributors are already paying high fees to carry Spectrum SportsNet (Lakers, Sparks, and Galaxy games) and Prime Ticket (Clippers, Angels, Kings, and Ducks games). Most distributors balked at paying such a high price, and in 2014 Time Warner Cable was the only major network to carry SportsNet LA, meaning only roughly 30 percent of area residents could watch Dodgers games. Midway through the 2015 season Charter agreed to carry the channel—shortly after striking a deal to acquire Time Warner Cable—increasing that percentage to 50, which is where things still stand. But according to the federal government, many of these television distributors didn’t come to the independent conclusion not to pay SportsNet LA’s carriage fee. The federal government filed a lawsuit last week against DirecTV and AT&T—AT&T acquired DirecTV last summer—accusing the satellite provider of being at the center of a scheme to collude with other television distributors to hold firm against SportsNet LA’s demands. In particular, the government’s lawsuit cites a number of instances in which DirecTV’s Chief Content Officer, Daniel York, communicated with his counterparts at other competing cable providers in order to exchange confidential, non-public information regarding the providers’ respective negotiations with Time Warner. During a conversation with Cox’s senior vice president of content acquisition, for example, York allegedly told his competitor that DirecTV was nowhere close to agreeing to carry the network, with the two executives promising to give each other a heads-up before either signed a deal with Time Warner. The incentive for colluding is clear. If, say, Verizon carried SportsNet LA and DirecTV didn’t, customers who wanted to watch Dodgers game might dump DirecTV for Verizon, and in the end all distributors would probably carry the channel for fear of losing customers. But by enough of them holding firm, they could all avoid losing customers and paying SportsNet LA’s carrier fee. Though much evidence—DirecTV documents, sworn testimony from Cox and Charter execs—is amassed against DirecTV, the company denies the charge. And the government’s suit doesn’t seek damages or to force distributors to carry SportsNet LA, but for the court to simply prevent DirecTV from colluding with its competitors in carriage negotiations. If successful, it won’t automatically mean everybody in the Los Angeles area can watch Dodgers games. But without collusion, and knowing the Justice Department is watching quite closely, the likeliest outcome is that the great Dodgers blackout will end in relatively short order.